Badge: A buck's head above a coronet. Septs of the Clan: Adam, Adamson, Addie, Adie, Addison, Aiken, Aitchison, Atkin, Atkins, Atkinson, Badenoch, Barrie, Connor, Connon, Craig, Cromb, Crombie, Cullen, Culane, Darg, Darge, Dorward, Duff, Durward, Eadie, Eddie, Edie, Edison, Esslemont, Garden, Gardiner, Gardner, Garioch, Garrick, Garroick, Geddes, Gerrie, Harrison, Huntley, Huntly, Jessiman, Jopp, Jupp, Laing, Lang, Laurie, Lawrie, Leng, Ling, MacAdam, Mallett, Manteach, Marr, Maver, Meldrum, Mill, Mills, Milles, Miln, Milne, Milner, More, Morrice, Muir, Mylne, Steel, Teal, Tod, Todd, Troup. 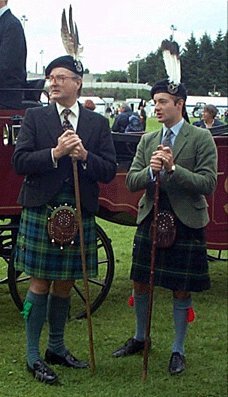 Clan Chief, The Marquis of Huntly and his son The Earl of Aboyne. Picture taken by Jerry Gordon of Georgia and was taken on the Gordon School grounds in Huntly during the Gordon 2000 festivities.